What do hot chips and an early morning winter breakfast at the Kohewhata Marae in Kaikohe have in common? Another successful Chip Group training workshop where engaged locals learnt how to prepare healthier hot chips. Working together as ‘prevention partners’ The Chip Group and Healthy Families Far North helped empower attendees about the role and responsibility they have to improve the health of their community. The Far North and Kaikohe in particular is known to have an over-saturation of food outlets which is having a negative impact on the health and wellbeing of the local population. We were so thankful to Kate for conducting a training at Kohewhata Marae. This added to our partnership with the Marae as they are making significant changes to the food they serve, while promoting healthier options with other Marae and across their community. – Shirleyanne Brown, Healthy Families Far North. 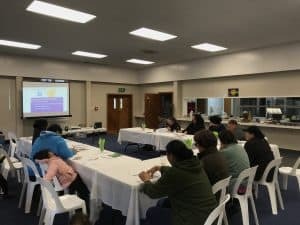 Part of the Chip Group’s contract with the Ministry of Health is to work closely alongside the ten different Healthy Families groups across New Zealand and this was our first time engaging with the Far North team. We look forward to continuing this relationship and hosting similar sessions throughout the country.